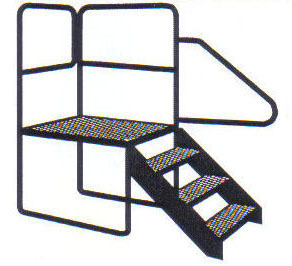 These steel steps provide years of service through the heavy duty construction and materials used. 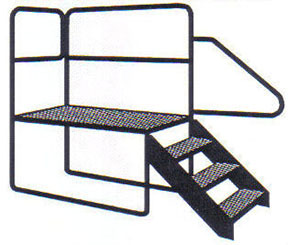 The open grate allows mud, dirt, sand and snow to fall through reducing the maintenance to your units flooring. 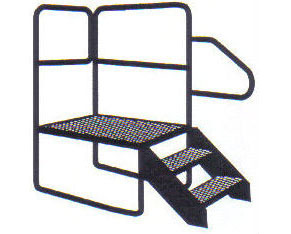 The step assembly is removed from the platform to limit the weight any one person is required to lift. 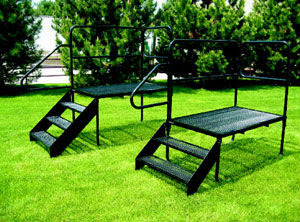 The 1-1/2" handrails are interchangeable to either side of the step. These steps are 36" wide, the treads are 10" deep and they have a 8-1/2" rise. *Discounts available when ordered in quantities of 5 or more. Platform 36" x 36", treads 36" x 10". Total step height 25.5" at 8.5" rise. All rails are 1.5" dia. tubing that meets OSHA requirements. 137 lbs ea. Platform 36" x 36", treads 36" x 10". Total step height 34" at 8.5" rise. All rails are 1.5" dia. tubing that meets OSHA requirements. 161 lbs ea. Platform 36" x 60", treads 36" x 10". Total step height 25.5" at 8.5" rise. All rails are 1.5" dia. tubing that meets OSHA requirements. 171 lbs ea. Platform 36" x 60", treads 36" x 10". Total step height 34" at 8.5" rise. All rails are 1.5" dia. tubing that meets OSHA requirements. 193 lbs ea. This small, sturdy step stool is perfect for all those little jobs around the RV. Opens to 11-1/2" tall. 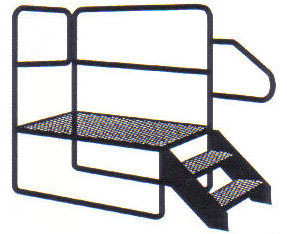 Lightweight aluminum construction.